Posted By:Unknown | At:11:34 AM Be the first to comment! LOS ANGELES (AP) — Katherine Jackson, the mother of Michael Jackson and the guardian of his three minor children, has been reported missing, but the Los Angeles County Sheriff's Department says she is with family members. Paris Jackson, the 14-year-old daughter of the late legend, tweeted early Sunday morning that her grandmother was missing: "I haven't spoken with her in a week I want her home now," she posted from her Twitter account. She also tweeted a number for people to contact in case they saw the 82-year-old matriarch of the famous singing clan. The sherriff's department said another family member officially reported her missing Saturday night because he couldn't speak with her and was concerned. 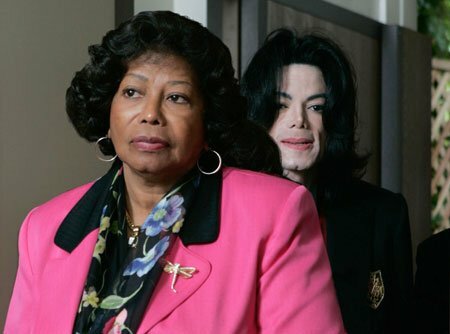 While the authorities are trying to reach Katherine Jackson, they also say she is with family members. The family drama unfolded days after it was revealed that some of her children had written a letter to the executors of Jackson's estate, alleging Michael Jackson's will, which left his fortune to his children, his mother and charity, was a fake. The undated letter, signed by Janet, Randy, Tito, Rebbie and Jermaine Jackson, alleged that Katherine Jackson was being manipulated by the executors, John Branca and John McClain, and said her health had been affected, and she had suffered a mini-stroke. The veracity of the letter was confirmed by Randy Jackson on Twitter; Janet Jackson retweeted his post (The estate has denied the accusations). However, Paris Jackson lashed out at her uncle on Twitter, saying her grandmother was fine: "I will defend my beloved family member with all I have, even if it means from other family members." She later apologized, saying she just wanted to let people know that her grandmother did not have a stroke. On Saturday, Jermaine Jackson tweeted that his mother was resting on the orders of a doctor in Arizona: "This is our mother and her health is paramount. We are not inventing or plotting anything. We are following doctor's advice. Period."" However, Paris Jackson tweeted on Sunday: "The same doctor that testified on behalf of dr murray saying my father was a drug addict (a lie) is caring for my grandmother ... just saying." Murray was convicted of involuntary manslaughter for the June 2009 propofol overdose death of Jackson at age 50. Katherine Jackson has been caring for Paris, Prince Michael and Blanket Jackson since their father's death. It is unclear who is taking care of the children in her absence. A representative for the Jackson brothers Jermaine, Jackie, Tito and Marlon, who are on a nationwide tour, did not immediately respond to an early Sunday morning request for comment, nor did a representative for Janet Jackson.